Some of the cooler thermal run-off channels pulse with activity due to tiny winged insects called ephydrid (ef-id-rid) flies. These flies mate in the hot springs and their larvae devour the bacteria and other microorganisms of the hydrothermal areas. 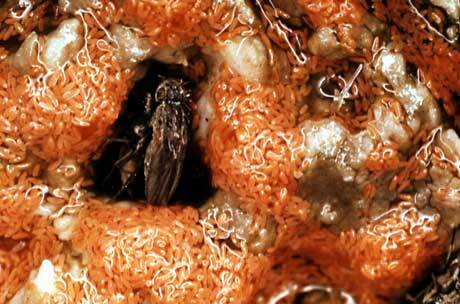 The flies are active even in winter because the thermal water creates a year-round summer climate. The adults can’t live in temperatures greater than about 109° F (43° C); however, they go partway underwater insulated by a bubble of air in order to feed in hotter water. In turn, they become a source of food for other animals. By scuttling rapidly across bacterial or algal mats, spiders are able to cross hotter water than they can otherwise tolerate. Their reward is fresh meat in the form of adult ephydrid flies.